Are you ready for a truly horrifying confession? Here it comes. Brace yourself. I have never eaten a pop tart. Never. <GASP!> Oh the humanity!! Now I suppose people of a certain age who all had mothers vacuuming in pearls and cooking 6 hour roasts for dinner every week will not find this shocking. But I was born in the 80’s. I grew up during the boom of ease, convenience and microwave meals. I played my Commodore 64 wearing the only Esprit sweatshirt I owned and thought I was the height of technology and fashion. Pop tarts are pretty much considered an essential breakfast food for my generation. For whatever reason, my mom never bought them. Actually, now that I think about it, I’m pretty sure my first microwave meal was in my 20’s when I discovered Lean Cuisines. My mother totally preferred to do things the old-fashioned way. From scratch – in the oven. Anyway, back to Pop Tarts. I suppose I could have bummed one off a friend at the bus stop. They seemed so cool with their breakfast wrapped up in a paper towel, munching on it while waiting for the bus. Think of how much longer they got to sleep in! Alas, at the time, I never thought to ask. Probably because frozen dough with a little fruit filling just didn’t seem that appetizing to me. However, a homemade version has promise. When I read the description “like a little frosted jammy pie“, I was sold. I do love pie. And frosting. These are super fast and easy if you (like I did) use refrigerated pie crust. If you are a rock star, feel free to make your own crust. My kids wanted to do Christmas sprinkles on top and I tinged my icing with a wee bit of the strawberry jam to give it just a hint of pink. I also left a few of these unfrosted and put them in the freezer after cooking/cooling. I figure some morning when I don’t have time to make breakfast, I can pop them in the toaster and truly live out the lost pop tart experiences of my childhood. I might even wrap them in a paper towel before eating. Roll out one of the pie crusts and square the edges. Cut into rectangles. Place 1 tsp of jam in the center of a rectangle and top with another piece of crust. Crimp all four edges. Repeat until all of the pie crust is used. 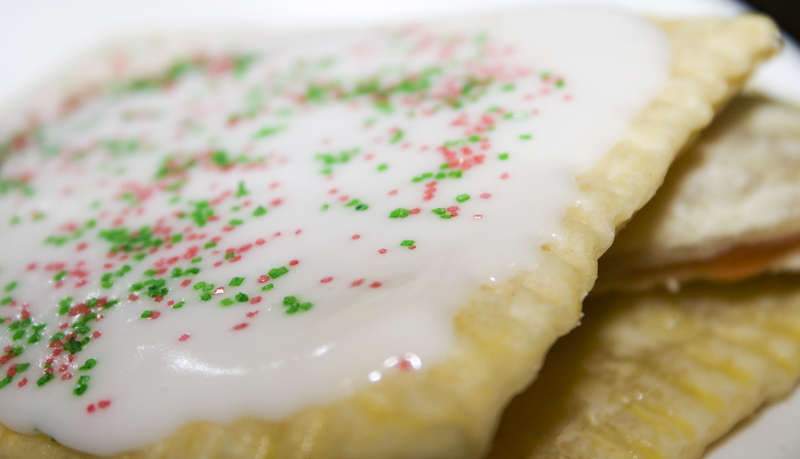 Take the rounded edges that you cut off and roll them together to form more pop-tarts. Brush with egg wash.
Place on a baking sheet lined with parchment paper. 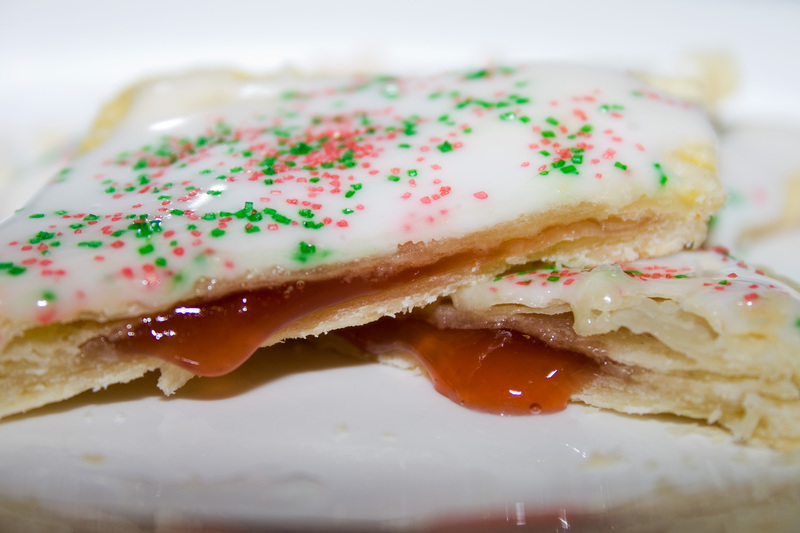 Bake the pop-tarts for about 7 – 8 minutes or until slightly brown. Once cool, pour glaze over and decorate with sugar. If you don’t want to add extra sugar with the glaze, you can use an egg wash on the tops with some white sugar. Place powdered sugar in bowl. Pour milk slowly until it has a consistency of really thick syrup.